KG1a leukemia acute myeloid cell line This antibody gave a positive result in IHC in the following FFPE tissue: Human Skin Melanoma. Our Abpromise guarantee covers the use of ab9524 in the following tested applications. Human peripheral blood lymphocytes stained with ab9524 (red line). Human whole blood was processed using a modified protocol based on Chow et al, 2005 (PMID: 16080188). In brief, human whole blood was fixed in 4% formaldehyde (methanol-free) for 10 min at 22°C. Red blood cells were then lyzed by the addition of Triton X-100 (final concentration - 0.1%) for 15 min at 37°C. For experimentation, cells were treated with 50% methanol (-20°C) for 15 min at 4°C. Cells were then incubated with the antibody (ab9524, 0.1μg/1x106 cells) for 30 min at 4°C. The secondary antibody used was Alexa Fluor® 488 goat anti-mouse IgG (H&L) (ab150113) at 1/2000 dilution for 30 min at 4°C. Isotype control antibody (black line) was mouse IgG1 [ICIGG1] (ab91353, 0.1μg/1x106 cells) used under the same conditions. Unlabelled sample (blue line) was also used as a control. Acquisition of >30,000 total events were collected using a 20mW Argon ion laser (488nm) and 525/30 bandpass filter. Gating strategy - peripheral blood lymphocytes. IHC image of CD44 staining in Human Skin Melanoma formalin fixed paraffin embedded tissue section, performed on a Leica Bond™ system using the standard protocol F. The section was pre-treated using heat mediated antigen retrieval with sodium citrate buffer (pH6, epitope retrieval solution 1) for 20 mins. The section was then incubated with ab9524, 0.5 µg/ml, for 15 mins at room temperature and detected using an HRP conjugated compact polymer system. DAB was used as the chromogen. The section was then counterstained with haematoxylin and mounted with DPX. Western blotting of HPB-ALL cell lysate (non-reduced sample) stained by ab9524. Publishing research using ab9524? Please let us know so that we can cite the reference in this datasheet. Can you please send me references regarding the CD44 antibody? Also, what forms does the antibody recognize? Thank your for your recent enquiry regarding CD44 antibody ab9524. Unfortunately the epitope that this antibody reacts with is not known, we only know it reacts with the extracellular (N terminal) domain of cd44. Unfortunately I have been unable to find any publications referencing this antibody or the clone number for this monoclonal antiserum [MEM-263]. My apologies for the inconvenience. Why is it recommended to perform westerns under non-reducing conditions? I am specifically interested in which amino acid sequence this antibody is predicted to target. I need this information to ensure my experiment will work!! We only know it reacts with extracellular (N terminal) domain. Is the epitope extracellular (N-terminal) domain or cytoplasmic (C-tewrminal) domain? Is the antigen known/mapped ? i am very interested in a c-terminal antibody, but there I haven't found a commercial one. 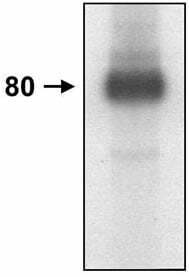 The epitope that this antibody reacts with is not known.